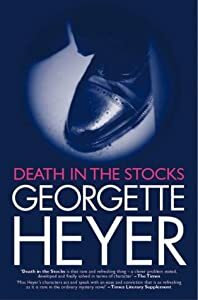 Review: Death in the Stocks by Georgette Heyer. If you are one of this genre’s fans the plot might seem already a bit cliche. A rich man from London, Arnold Vereker, is found murdered on the village green, stabbed in the back with his feet in the stocks. A “funny” murder or the right punishment or both? The police soon find out nobody is very sorry to see the man dead – he was an extremely selfish, unpleasant creature. The suspicion at once falls on his immediate and rather poor family – an entertainingly eccentric half-brother, Kenneth, who is a budding artist, and a tomboy half-sister, Antonia (Tony), the breeder of bull terriers. None of them has anything close to a cast-iron alibi. What’s more, they both profited from the murder, inheriting a very handsome sum of money, not to mention a luxury London house and a country house as well. Did they murdered their brother in cold blood just for the filthy lucre? Is there another inheritor and another suspect? After all, the number of people who, for various reasons, loved the fact that Vereker has been sent on to his just rewards grows steadily with the story. As usual in Heyer’s novels, there are romantic complications as well – both siblings are on the brink of tying the knot with the wrong candidates. Will they realise their mistakes in time? Will the investigation help or hinder their pursuit of finding the right half? After several plot twists and red herrings, all interspersed with Hannasyde’s encounters with sometimes maddeningly eccentric Vereker family, the murder is resolved. The book will entertain you for sure as great characters and great dialogue is what the authoress excels at. The Verekers were a treat, all of them! The mysterious murderer’s identity was a bit of a surprise (although I guessed it before the ending) so I consider it an asset too. In my very humble opinion the plot could have moved a little faster; not always but from time to time anyway. Some scenes seemed to me quite unnecessary, even spurious. I didn’t like Tony’s fiancé very much for one thing and I wondered why it took such an intelligent girl so long to understand who and what he was. My second complaint is about the crime itself – although it was solved, the whole process was a little too quick and the ending seemed rather abrupt as if the authoress or her editor suddenly run out of time. I do missed these small theatricals of Monsieur Poirot who always presented the ugly deed from A to Z in a very exciting way. If you are, like me, a fan of the mysteries by Agatha Christie or Dorothy L.Sayers, set mostly in the English countryside, I can totally recommend Death In The Stocks to you. It will be a pleasant entertainment during these long autumn and winter evenings. If you prefer something more ambitious or more adventurous, though, think twice. 4 Responses to Review: Death in the Stocks by Georgette Heyer. I have this one, but I haven't read it yet. I need to get on that! I would love to read your review of this one, Brooke.